Quarterly results from Cisco Systems have just hit the wires, and they’re slightly better than expected. Earnings on a per-share basis were 51 cents on sales of $12.2 billion. Both numbers beat the consensus of Wall Street analysts, who had expected earnings of 49 cents on sales of $12.18 billion. Gross margins were 63 percent, which is about flat from the year-ago quarter. Sales in the Americas grew the most and were flat or slightly down in EMEA and Asia. Chambers said on the conference call with analysts, which is just getting under way, that sales in emerging countries showed “double digit” growth on a percentage basis. Overall sales grew 5 percent. 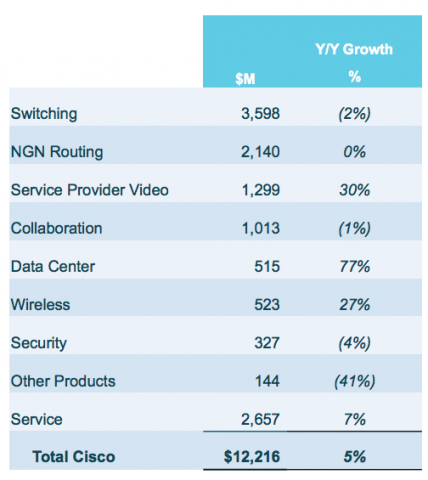 Here’s a snapshot from Cisco’s presentation slides, showing sales in various segments. As you can see, the data center business continues to grow like crazy, but it’s still a relatively small segment within Cisco. Service provider video grew nicely as well, as did the wireless segment. Switching, a key segment, was down. Chambers said that was because of weaknesses in Europe and in public sector spending generally. CFO Frank Calderoni said the company expects fourth-quarter sales to grow year on year in the range of 4 percent to 7 percent, which works out to about $12.2 billion to $12.5 billion in sales, which is more or less in line with what the Street expects. He said gross margins will be 61 percent to 62 percent. He said he sees per-share earnings to come in between 50 cents and 52 cents versus a consensus view of 51 cents. Cisco shares are rising in after-hours trading. They’re at $22.04, up nearly 4 percent, having closed at $21.21 during the regular session. Cisco, the worldwide leader in networking that transforms how people connect, communicate and collaborate, today reported its third quarter results for the period ended April 27, 2013. Cisco reported third quarter net sales of $12.2 billion, net income on a generally accepted accounting principles (GAAP) basis of $2.5 billion or $0.46 per share, and non-GAAP net income of $2.7 billion or $0.51 per share. Net sales for the first nine months of fiscal 2013 were $36.2 billion, compared with $34.4 billion for the first nine months of fiscal 2012. Net income for the first nine months of fiscal 2013, on a GAAP basis, was $7.7 billion or $1.44 per share, compared with $6.1 billion or $1.13 per share for the first nine months of fiscal 2012. Non-GAAP net income for the first nine months of fiscal 2013 was $8.0 billion or $1.50 per share, compared with $7.5 billion or $1.38 per share for the first nine months of fiscal 2012. A reconciliation between net income on a GAAP basis and non-GAAP net income is provided in the table on page 6. Cisco will discuss third quarter results and business outlook on a conference call and webcast at 1:30 p.m. Pacific Time today. Call information and related charts are available at http://investor.cisco.com. Cash flows from operations were $3.1 billion for the third quarter of fiscal 2013, compared with $3.3 billion for the second quarter of fiscal 2013, and compared with $3.0 billion for the third quarter of fiscal 2012. Cash and cash equivalents and investments were $47.4 billion at the end of the third quarter of fiscal 2013, compared with $46.4 billion at the end of the second quarter of fiscal 2013, and compared with $48.7 billion at the end of fiscal 2012. The combination of cash used for dividends and common stock repurchases under the stock repurchase program totaled approximately $1.8 billion. Cisco paid a cash dividend of $0.17 per common share, or $905 million. 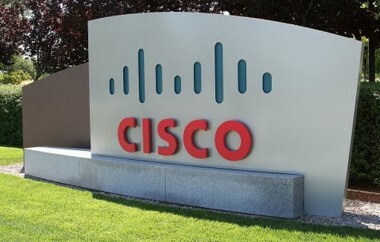 Cisco repurchased approximately 41 million shares of common stock under the stock repurchase program at an average price of $20.85 per share for an aggregate purchase price of $860 million. As of April 27, 2013, Cisco had repurchased and retired 3.8 billion shares of Cisco common stock at an average price of $20.35 per share for an aggregate purchase price of approximately $77.7 billion since the inception of the stock repurchase program. The remaining authorized amount for stock repurchases under this program is approximately $4.3 billion with no termination date. Cisco completed the acquisition of privately held Intucell, Ltd., a provider of advanced self-optimizing network (SON) software solutions that enable mobile carriers to plan, configure, manage, optimize, and heal cellular networks automatically, according to changing network demands. Cisco announced and completed the acquisition of Cognitive Security, a privately-held company headquartered in Prague, Czech Republic. Cognitive Security’s solution integrates a range of sophisticated software technologies to identify and analyze key IT security threats through advanced behavioral analysis of real-time data. Cisco announced its intent to acquire SolveDirect, a privately held company headquartered in Vienna, Austria that provides innovative, cloud-delivered services management integration software and services. Cisco announced its intent to acquire privately held Ubiquisys, a leading provider of intelligent 3G and long-term evolution (LTE) small-cell technologies that provide seamless connectivity across mobile heterogeneous networks for service providers. Cisco unveiled its new IP Interoperability and Collaboration System (IPICS) solution, a new set of multivendor, interoperable communications capabilities for operations and dispatch centers across government and enterprise industries. Cisco announced its Cisco Integrated Services Router with Application Experience (ISR-AX), which converges routing, security technologies and a comprehensive suite of application-level services into a single-box solution designed to deliver the essential services needed at branch offices. Cisco introduced its next-generation 100 Gigabit CMOS-based transceiver, Cisco CPAK™, the industry’s most compact and power-efficient 100 Gps transceiver technology, designed to reduce space and power requirements by more than 70 percent compared with alternative transceiver form factors, such as CFP. Cisco introduced product innovations for data center and cloud environments including the following: highest-density 40-gigabit Layer 2/3 fixed switch; simplest hybrid cloud solution; and expansion of the Cisco® Open Network Environment with the most extensible controller. Cisco announced new Cisco Unified Access™ solutions that simplify network design by converging wired and wireless networks. Vodafone Netherlands, the second largest telecom service provider in the Netherlands, deployed the Broadband Network Gateway (BNG) Service Manager — enabling it to increase scalability and service velocity for its enterprise customers. Cisco announced that MetroPCS Communications began a commercial launch of its Cisco Carrier-Grade Internet Protocol Version 6 Solution as a first step in the transition of its mobile Internet network to Internet Protocol version 6 (IPv6). Cisco announced that GET, a leading cable operator in Norway, selected the Cisco Videoscape™ Unity video services delivery platform to transform its TV service and enable the deployment of next-generation entertainment experiences, including personalized and synchronized TV across multiple devices. Cisco announced that SFR, a leading mobile telecommunications provider in France, selected Cisco to expand and enhance its mobile Internet network in order to accelerate the deployment of advanced 4G LTE services to its customers. Cisco announced that Turkcell, the leading communications and technology company in Turkey with more than 35 million subscribers, has deployed the Cisco ASR 5000 Series as the foundation for its advanced mobile Internet network.